This week, I decided to get answers to both questions. My horses have always like the German Stud Muffins so I thought I’d try my hand at making those. I searched online for recipes, found a few I liked and combined them to meet some of my horses needs (ie, I added more flaxseed because of it’s health benefits, swapped carrots for pears, etc). Following is the recipe I came up with as well as the steps I used to create my own version of these muffins. Preheat oven to 350 degrees. And grease, grease, GREASE your muffin tins if you don’t want to have to chip the muffins out of the tins. I applied 2 heavy coats of PAM and had no issues however when I used only 1 coat, I struggled to get the muffins out of the pan. Mix the molasses and steel cut oats until the oats are fully coated with the molasses. Gradually add the flour, flaxseed and cornstarch until well mixed. Add processed carrot and apple and mix well. Bake 15-20 minutes. Remove immediately from pan and cool on a wire rack. When the muffins are still slightly warm, press a peppermint candy in the middle. I took these treats to the barn the next day and my horses (even the finicky eaters) LOVED them. I appreciated the fact that there was not an extensive list of ingredients and they were simple to make. 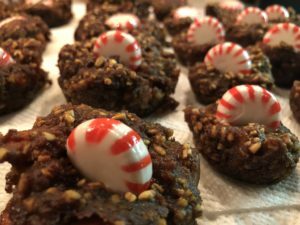 It was fun to make these treats and I felt like I was doing something really special for my horses. I’m going to be making these again before Christmas and the next time, I’m going to enlist the aid of my granddaughters.